Glenfarclas has never disappointed even though heavily sherried whiskys aren't always my favourite style. The 15 seems a perennial favourite with many and I have sat on this bottle for almost two years before opening it a few weeks ago. I'm sad to say about half the bottle has gone and these notes are from a neat pour that's sat for about twenty minutes. On the nose is a softened but full sherry nose with just more than a wisp of smoke. Fresh red fruit and dried in abundance; fig, date and raisin are all there as are hints of dark plums, berries and tangy red apple. There's a touch of creamy vanilla, woody spices like cinnamon, and also a slight medicinal 'gum-boil lozenge' note that I get with a lot of sherried whiskies - but this is well integrated and not dominating. It's well-balanced and inviting. Taste wise it's all fresh fruit at first with a nice balance of sweet and sour with the same notes on the palette as the nose. Then comes the dry fruits, then the spices, with the vanilla being overtook by the cinnamon. It ends on a slightly sour and dry cinnamon note but a certain fruity creaminess lingers for a good while. Mouth feel is full and, well, delightful, actually. This can take a lot of water and it softens the experience and brings about more of the spice and sour fruit notes. I prefer it neat, rich and unctuous. Overall - as good a sherry based whisky as I've had and it pulls off a neat trick of being complex and interesting whilst being one of the easiest malts to drink I've had the pleasure of! Would recommend in a heartbeat, especially if you like your sherried drams. Great review. I've got an unopened bottle of Glenfarclas 15 that was a gift set that came with a 50cl bottle of the 21 and 25 year old that I can't wait to crack the seal on! @casualtorture - This could well be my staple xmas whisky (if there weren't so many others to discover . . .) and I can see why many describe it as Christmas cake in a glass. I was getting that and some orange peel and a slight nuttiness on my last dram. Really, really good stuff! The Glenfarclas 15. No color added, bottled at 46% instead of 43% like most of their standards because apparently that's the way the founder enjoyed it. Bottle is 90% full and has been opened for about 2 weeks to allow for some air time. This is currently not commercially availible in the US. Palate: Cherries, lots of them. Followed by chocolate, cherry cola (Dr Pepper-ish but more cherry), bitter coca bean, and rasberries. The sweetness is balanced by a slight coffee-like bitterness. The longer you hold this in your mouth the sweeter it gets. It was a fun game trying to get a perfect balance with the sweetness and the bitter coca bean. About 7-8 seconds seems to do the trick for me. Finish: The finish transitions into a bit more maltyness. Starts with chocolate, cinnamon, and dates, then come baking spices (nutmeg), and some malty nuttiness (pecans and walnuts), finally ending with marzipan and more cherry cola. Sensory trip: Drinking this I imagine coffee and milk chocolate truffles walking hand in hand through an orchard of plums and cherries, eating marzipan as it snows nutmeg, cinnamon and powdered sugar. This also strongly reminds me of my favorite German dessert, cherry stollen. Thoughts: What a wonderful whisky! Definately a step up from the 12yo (which is what drove me to try this one). Dear Glenfarclas, please send a few bottles to the USA so I can buy them. I'm from Bama, where shipping alcohol is illegal. However, I'll likely be going to Nashville when I go back. Not many financial analyst jobs in Alabama and my father lives in Franklin. Tenn does allow shipping to your home. But honestly I'm open to living anywhere. As far as bringing it back, there are 3 people flying so that's 6 bottles! Maybe two Talisker 10s since it's so cheap here and 4 Farclas 15s haha. @casualtorture I have enjoyed every octomore I've tried. My favourite so far (with a few more to sample) is, I believe, the 4.1. I have a sample of this...sounds like I need to try it sooner than later! Well, this sounds promising--as I recently purchased a bottle of GF 15yo (rare in my area, where we usually see the 17yo expression). I opened this whisky on Christmas eve and how appropriate it was. A sweet, full-bodied and warming whisky perfect for a night together with your loved ones while a blizzard rages outside the window. The nose immediately lets on what you're in for. Sweet honeyed dates and perhaps a small hint of peat. Traditional Christmas pudding and sweet dried figs. It really is quite a sweet treat. Allowing it to open up a bit in the glass elevates the experience and introduces chocolate covered raisins, sugared orange peel, a touch of green mint, walnuts and old quality leather. Plenty of time in the glass really lets the sherry casks speak loudly and adding water adds a distinct note of bramble. The palate starts of lovely with big cherries and milk chocolate praline. It is sweet and round going into Winter spice and Heather honey. The finish offers a slight black tea bitterness, chocolate and mildly drying subtle oak. It fades away leaving me with fragrant, bitter orange peel. After it has died theres a lingering mineral, flinty feel in the mouth. @Alexsweden It seems you have the good version of Farclas 15. I had a bottle in 2012 that was incredible buT my actual bottle has a big alcohol burst that is annoying. Farclas are probably the best at getting the Christmas cake spices. Enjoy! Another sample courtesy of @paddockjudge. I’ve tried the Glenfarclas 105 10 year and found it a little rough, though it did improve with some water. Without going back and looking at that review, how will a lower ABV and 5 more years in oak affect this distillate? Neat - right off the bat I get the same vegetal smell as I get from the Bladnoch 12. Could this be the effect of sulfur? I’ll give it 10 min in the glass uncovered, then cover it for 5 and see what happens. I scored it as it was with the water, because that is how I would take it. I’ll experiment with the remaining sample in the future and we’ll see if things change over time. @Nozinan good review. Your notes are consistent to my experience: dark chocolate and red fruits. I quite like the 15 a lot. Yet I find that Glenfarclas's "house style" really shines once you reach 21 onwards, yet becoming more gentle. As a contradiction, I find the 25 to be more aggressive than the 21, 30 & 40. And for some reason, I prefer the 25 in this distillers style. Love this whisky, great nose, and fab finish - Def not one for sharing, this one's for me alone! I would suggest you "waste" 30cc by inviting a friend over who appreciates sherry matured whisky. My suspicion is that you'll enjoy it even more with company. Full amber in colour and no suggestion of artificial colouring. Sweet sherry, burnt toffee, leather and coca on the aroma. The palate is full of rich sherry cask influences but much more than that is going on if you give it time to develop. Toffee, crystal malt, burnt toast, sherry, coca, liquorish, some coffee like bitterness, bramble fruitiness and a bit of dark rum seems to have got in somehow. The mouth feel is full and creamy, and despite the 46% it’s smooth and lacking in alcohol burn. The finish is quite sweet and a malty, although not achingly long. The liquorish, coffee ad blackberry hang around for the finish. A fine and good value malt, that has arguably been Glenfarclass’s class act for some years. Some recent reviews suggest it might have gone downhill, but this bottle seems up to scratch to me. The nose is certainly good. I find the taste better, although more intoxicating. Recently, I had on the same night the 105 and A'bunadh batch 46. I said on another thread that it was unfair to compare the two of it and that it would be more interesting to compare the 105 to the 15 yo. So here I am. I am comparing two bottles that are from this year and have been opened for 2 to 3 weeks and that are both 85% full. The 15 yo has improved a lot over the weeks. The alcool is not as presents as it was fresh opened. But it is still there bringing a very winy Sherry influence with a dry spicy wood and some green cereals. With air and time you have cherries and almond like on a Canadian rye. The big difference with 105 is the presence of the malt giving more heavy notes to this whisky. The chocolate has more richness so does the spices and the wood. but everything remain a bit closed. The 15 yo is all about the dry wood and the spices. the body is rich enough to be interesting but there is a lack of fruit and they are not well defined. The 105 is way more spicier. You have pepper, cayenne, chocolate and Sherry wine with some sweetness and just before a good alcohol burn that carry the wooden spices. Then the malt is coming back quite heavy, in a good way. When the 15 leaves you with the dry wood, the 105 end with the wine notes and a late and surprising bitterness. The nose is the best part of the 15 yo and I believe it announces improvement over time and air. The 105 is still closed but on the palate it is a clear winner. The biggest difference between these two whiskies is the presence of the malt in the 105 making it so more rich. The 105 has also a more fruity Sherry although the wood spices are more defined in the 15 yo they are more on the high notes side while the spices of the 105 are hotter if I my say so. The finish are not there strong point. If the 105 as a longer finish, it also make the bitter note more obvious. At the end, the 105 is the best... for the moment. I think the 15 yo will continue to improve and may become the best of the two. Nice review. I like the way you put the same notes in 2 reviews so a reader can search either expression. Well done. I bought this bottle a month ago and opened it a little bit over two weeks ago. For the first two weeks it was simply undrinkable the alcool coming out of the block really roughing your senses to the ground. Now, it's a surprise. The nose has more malt than usual and the sherry is all about chocolate at first. Then you have this fine leather with nutmeg a gentle cinnamon and none of the spicy side of the clove. The spices are again incredibly gentle. There is also a sour note coming from the malt with a vegetable hint if you look for it. The palate translate the nose with a lot of extra. First there is a splash of hot spices I can't described. There is some pepper and something else. Then the leather is superb, even if you have a bit of chemicals with it. But it seems this leather has marinated in a mix of nutmeg and cinnamon. The malt is not as present as in the nose but the vegetable is still there. And from beginning to end the chocolate is coating nicely everything even the vanilla that came at the end. I don't like to add water to my whisky but when I used my saliva the fruit were coming out from the sherry, mainly raisin and plum. The finish leave you with a more conventional Farclas integrated flavor without the chocolate or the pepper. Not very long on the strong side but your memory has to go on for ever on those gentle spices leaving you salivating for more. This Farclas 15 yo was a surprise to me by is big chocolate and the alcool bite that came at first. A few weeks before I bought this bottle, I had a dram of the 17 yo and it was more winney, and with the spices I associate with Farclas. In fact, this 17 yo was more like the 15 yo I had 2 or 3 years ago than the 15 yo I am now reviewing. This Farclas is reacting very well and very fast to air: even a pour should not be left unattended for more than half an hour. It is just a guess but I doubt this one would stand at his peak longer than a few months. It doesn't matter because this bottle will be long gone before that! A month later, this scotch as sustained very well. The chocolate as faded more than a bit to leave place to coffee notes. Everything else stayed about the same. I would like to add that this 15 yo taste younger than the previous 15 yo and what it lacks in refinement it mades up in boldness. Although I think I was too generous and need to bring back my score from 89 to 85 as I am missing the smoothness of the baking spices of the old 15 yo. NOSE: complex, sweet, creamy sherry, slight hint of mint, hazelnuts, almonds, a touch of clove; moist chocolate cake topped with cherry sauce, cola. TASTE: sophisticated, nutty, sherried arrival that develops into an explosive bouquet of complex flavors. FINISH: very, very long and warming. Tannins and cocoa powder. As explained in the above link, "amber" is not terribly dark on the colour spectrum for whisky. I think you're fine. I'm jealous. I can't buy the Glenfarclas 15. Enjoy that bottle, Georgie! FROM GLENFARCLAS'S WEBSITE: Colour [of the 15]: A rich golden amber. Nose: Damn! This is what sherried malt is supposed to be about! Strong, rich, beautiful sherry-grape flavours...dark fruits, plums, black cherries, raisins, you can find the common apple and pear in there too, if you look. Lots of medium pitches to "hear", if you listen, but also plenty of high and low pitches to give it balance. The wood and malt take a back seat to the sherry cask flavours, but who cares, when the sherry is this good? Although i am a 'farclas fan, i dissapointingly haven't ventured with the 15 yo yet. This review sure salivated my curiosity towards this malt, it has sneaked into flagship status for this distillery. The 12 year old has seemed to join it now, tasted it this summer, very impressed! Great review btw! @Lifewaterforce, thank you for enjoying the review. Mr. Murray apparently got a bottle of Glenfarclas 15 in the last couple of years that disappointed him, but personally, I have not known anyone who has ever gotten a bad bottle. It is a sensational whisky. Quite beautiful. Thats the first word that comes to mind (juicy), this is a very good whisky at an even better price (AUD $120). Non Chill Filtered, no caramel, whisky the traditional way. Nose: rich and juicy, really fruity, pears and apples for sure, toffee, lots of sweet sherry, some clove and a healthy dollop of vanilla. With Water richer, bigger almost muscular, another dollop of vanilla, and a bit more caramel too. Pallet: pears, fruitcake, malt spice, light toffee, almonds and raisins, just a suggestion of peat and smoke too. With Water everything from neat but turned up a notch, peat is more evident, lovely caramel as well. I was looking to compare this whisky to the GlenDronach 15 but they are completley different, the Dronach is much darker and a little older tasting, this is beautifully fresh, contains well balanced big flavours and a beautiful mouth feel. Also i really enjoy the suggestions of peat and smoke, great stuff. Highly recommended! Nose: Wonderful and sweet. Nougat and vanilla wrapped in milk chocolate laced with orange zest. Develops depth from dates and salty caramel, which is tangy with orange peel towards the end of the breath. Palate: Sour cherry enters sweet with vanilla; cinnamon progresses to gingery; and finishes with sweet orange and serious, deep walnut (combination of its skins and its toasted flesh). Finish: There remains an orange sharpness on the tongue. Meanwhile, the walnuts from the palate are like buttery vanilla, augmented by raisin and with a tingle of ginger. This reminds me most of the Glengoyne 21: Both are superb sherry-matured malts, deep and complex. The Glengoyne leaned towards spice (much more the "Christmas spice" that others refer to), while this Glenfarclas leans more towards fruit and toffee while avoiding most traces of bitterness. The Aberlour 18 is also sweet and delightful, but lacks some of the deeper flavors in the palate. I am once again impressed with the maturity of Glenfarclas malts. So far, my sense is that one could add 5 years to their age statements arrive at a more accurate indicator. What a cracker! In my review of the Glenfarclas 10 year old I mentioned how the distillery is a family business that is currently in the hands of the 6th successive generation. When drinking this I really don't mind where it comes from because this bottle stands out on it own. It is a wonderful sherried whisky which oozes class and competence. The finish is long with sweet sherry, dried fruits and a mild spice. I have seen the description of Christmas cake used for this bottle and I can't disagree. It's a real gem and one to be savoured. This may well become a regular in my cabinet. In all fairness, I should mention that the OLCC in Oregon does provide some distinct advantages to whisky connosrs here: the online database allows Oregonians to track bottles within the state to a remarkable degree. It also keeps down the prices on some rare bottles, such as Pappy van Winkles. I probably would never have been able to acquire a bottle of the Pappy 20 Year in a non-regulated state. It would have been far too expensive for my budget, and too hard to find. Because of the OLCC's standardized pricing index, I was able to buy a bottle for a very reasonable price (after waiting in line for two hours at the liquor store). When Washington State was deregulated, most of the gourmet bottles became very hard to find and much more expensive, from what I hear. The comment above merely reflects my frustration at not being able to order samples from top notch companies such as Malt Masters. I would dearly love to be able to buy samples before investing in bottles. Plus, I can't order any bottles from anywhere. All I can do is try to place special orders through liquor stores and this rarely ever works. I've clicked on Malt Masters a few times, just to drool over the selection and inexpensive shipping prices. Folks in the UK have it really good when it comes to single malts. That's for sure. Words cannot express how pissed I am that I cannot buy the Farc 15 in Oregon and I cannot have it shipped from Scotland to Oregon. Thank you OLCC. Eat my shorts. I like spirits with a strong character. I want flavour and complexity. I also seek out smoothness. Not many spirits achieve that perfect balance of smoothness and character. In my experiece, albeit limited, I have encountered very few whiskies can have a strong, powerful personality while maintaining a balanced smoothness. This dram is so masterfully balanced it's absurd. Nose: Figs, cherries, and baked apple pie with cinnamon. Other mild spices are there. It's interesting, complex, and has a very well rounded nose with a bit of everything you'd want from a sherried 15 year old. Taste: Honey, mild spices, and I really get cherries and other wild berry flavours. Having read the other reviews for this dram, I feel reluctant to follow the crowd on this one, but yeah, Christmas cake. Incredibly smooth without being creamy. It's just... balanced. I love this whisky because it's exactly what you'd want and expect. I have a hard time imagining anyone being outright disappointed by this dram. When I drink this, two things occur to me. One; this distillery (the 15 year old bottling in particular) has achieved a level of balance that other distilleries could only dream of. Two; it's almost too balanced. All of the flavours dance around each other so seamlessly that I find myself searching for something distinctive about it. Perhaps the prominent berries? Perhaps the Christmas cake flavours? It's incredibly flavourful but not incredibly distinctive because the distillers have done almost TOO good a job at finding the perfect balance. How cynical of me to seek out flaws in (near) perfection. Fantastic sherried bliss. If you want balance, look here. Sidenote: Too much water seriously tames this whisky. Add a couple drops less than you would to other whiskies at 46%. @Pudge72 - Perhaps I should have gone higher. In retrospect, this deserves a better grade. 93-94 perhaps. It's an all time favorite of mine. And your father isn't the only 'uninitiated' admirer of this dram. My girlfriend isn't an avid whisky drinker herself, although I've helped her develop an appreciation. This is her absolute favorite whisky. Ironic how people tend to think Glenlivet or Glenfiddich or mild bourbon casked drams are the best start-ups for whisky beginners, because this one seems to win everyone over. Quality is quality. Absolutely love this review @hunggar!! I would add that what cemented the 'Christmas cake' profile for me was the finish on this one. Cinnamon, cloves, and nutmeg absolutely jumped out to me, especially a couple of minutes after the sipping. Just a beautiful bottle. When I first cracked it open on Christmas Day 2011, I poured some for my dad and his wife. My dad specifically commented that while he is not a whisky drinker, this one is really good!! This one goes one shade deeper in sherry from the 10 and 12 and not much else appears in this version. Somewhat more subtle nose of sherry and vanilla. Less fire-y than the 12 and smooth sherry influence comes to the fore (but displeases the taste crew). Interestingly the 10 year old remains the favourite. Paired with chocolate whisky and cara cara orange mousse. 10 is better than the 15? Wow. Interesting. Who woulda thunk it. I can't get the 15 in Oregon. Bummer. Not to be had at the Stillhouse, either. nose: a lot of sherry and honey, dried fruits, reminds the smell of a christmas cake, very sweet. taste: honey, brown sugar, dark caramel, hints of rock melon, good maltiness. finish: gently warming, angelica, bitter-sweet, not much wood on the palate. the persisting flavor that remains on the tongue is some sort of smokey tobacco note with a pleasant mellow and sweet bitterness. summary: very sweet, a lot of sherry. there is no smoke at all while nosing and tasting this glenfarclas, but it comes with the end and stays quite long, like a smokey tobacco tongue after a cigarette. there is a slightly dull and faint aftertaste somewhere there in my opinion, like a stale - liver note. not much but still undefinable. a very good single malt, but maybe I had to high expectations when I bought this whisky. I enjoy this bottle a lot, and it is indeed a very rounded and gentle malt, but it lacks of some character for me. very well balanced (maybe to much for me), but I expected some sort of surprise in there which I couldn't find. could be an 86 but I still don't get this extra kick and surprise while drinking it, so 84 for me. a lot of people describe this aftertaste with words such spicy or chocolate tones. a lot of this influences come with the european oak, but still reminds me of liver and iron. anyone else? Went to a Glenfarclas tasting led by George Grant recently, and we had an opportunity to taste almost the whole line! Plus an exclusive bottling for the liquor store we were tasting at! Truly superb distillery! Palate: It simply explodes in the mouth, but immediately mellows out and leads you by the hand slowly into the lovely sweet and absolutely savoury finish. I went to Edinburgh a the end of last year, and had not long been 'getting into' whisky tasting. I had decided that, along with doing some Christmas shopping in the Scottish wonderful city, that I would also taste a few whiskies whilst I had the opportunity, and treat myself to a bottle of the one I liked the most. Step forward Glenfarclas 15yo. The bartender in the Whisky Rooms bar had to get on some stepladders to get this bottle down, which made me feel that I was drinking something rather special. And indeed I was. Maybe it was the time of year, but the flavours in the whisky instantly brought feelings of Christmas and romance, jumpers, presents. Even Santa Claus himself. The next day I bought a bottle, and have been reliving Christmastime ever since. Nose: Deep sherry, plum, cherry. Cinnamon, nutmeg, orange. Dark chocolate. Ever so slightly smoky. Wonderfully complex. Warm and inviting. Taste: Big cherry, very sweet, then come the orange and spices. Bitter chocolate, cream, sugar, mince pies. Very Christmassy. Hints of tobacco. Beautifully balanced. Finish: A pure extension of the taste. The spiciness and zestiness play on the tongue, surrounded by smoke. Then chocolate and cherry - black forest gateaux! Long, warm and creamy. Wonderful. This is a brilliant whisky, very complexed but incredibly well balanced. Come December 24th, if you can bear to spare a small measure, I'm sure Santa Claus would love you to leave him a glass of this. Nose: The sherry is quite thick and creamy, red fruits, hints of nuts, a slight note of peppermint, hints of cocoa beans, very smooth. Palate: A solid sherry hit, raisins and dates, figs and some ripe forrest fruits, roast nuts, cocoa powder, like the nose the sherry here has a creamy quality to it, some dried citrus peals. Finish: Smooth, cocoa powder, very fruity, nutty (walnuts and roast almonds), flavours unfold very well. In the range of Glenfarclas the 15yo is where the sherry becomes intense (ages less then 15 like the 12 and 10 the sherry is much lighter) in there older range the 15 is probably the sweet spot in price and quality. I've had the 21 and 25 and wasn't a huge fan of the 21 and while I prefer the 25 by a little bit the price increase doesn't justify the extra cost over the 15yo. Great review, 'Jason0142'! My wife surprised me with this bottle at Christmas (excellent pick, as it is not currently available in Ontario...hopefully they will re-stock in the fall). I shared a dram with my dad and his wife on Xmas day. My dad, despite being one who does not normally drink whisky neat, found it 'wonderful'. A very cool shared experience. I have really noticed a strong cinnamon and cloves note on the finish, which added to the 'Christmas cake' profile of this excellent bottle. The 25 yo bottle is on my wishlist, though farther down due to cost, thank you for the comparison reviews. Thanks, if you want to have a look at other great sherryed whisky brands have a look at the distiller Glendronach, some of there single cask releases are completely awesome. Nose: A true sherry bomb with loads of butterscotch. The intense sweetness is balanced nicely with some green apples, blackberries, and orange zest. Plenty of rich malt with sherry and spice woven throughout. Taste: Heavily caramelized sugar, like the kind you find on some sweet BBQ. Maple syrup, rich fruit, a bit of spicy cinnamon. Really rich, deep, and mature. Finish: Charred oak with plenty of sherry and toffee. A perfect ending. Wow. This tastes 25 years old not 15. It's certainly a sherry bomb, but I think it has good balance and is very interesting. Go for it if you're thinking about it. If you aren't thinking about, maybe you should. @Jean-Luc, It is only the 15 that is unavailable here among the younger expressions. My guess is that perhaps Glenfarclas does not feel that they have sufficient stock of the Glenfarclas 15 to adequately supply it to the US market. We get plenty of the Glenfarclas 12, 17 and the A'bunadh. @Dellnola, thank you for the reference to The Whisky Exchange. We have a bit of a problem here in Maryland in that it is a felony crime to accept spirits through the mail. I do occasionally accept shipments of spirits through DC addresses, which is legal. That's a real drag Victor. I haven't really been able to figure out the omission of the 15 year old from the US market. The 17 year old is their de facto substitute. The only thing thing that I could think of is a lack of sufficient stock for the US. Of course the 40 year old is sent here and I can't imagine them having a lot of that stock either, but I guess the price of the 40 year old compared to the 15 keeps it from getting depleted. nose: soft, mellow caramel Oily, somewhat bitter mouthfeel. Caramel, cereals and a hint of wood intensifies into a warm, peppery finish. This is a sample I received from one of my friend. Balance: A very well dram with a nice complexity and balance that provides a very delightful moment. This winter I made my first Christmas cake. I followed a Nigel Slater recipe, and was wowed by the smell of it cooking in the oven. It's better than anything else I've ever baked - all those flavours and ingredients mixing together, and the aromas just fill the house. It smells better than bread cooking. Now, the Glenfarclas 15 - my first from that distillery - smells and tastes absolutely like Christmas cake. To be sure, I wafted it under my girlfriend’s nose (I think she's got a better sense of smell than me) and she’s agrees, though is insistent that it’s with the icing on top). There's the sweetness, the dried fruits. When you taste it there are immediately plenty of dried fruits again, as well as sherry; the peat isn’t that prominent, but is certainly discernible. It has a real weight in the mouth, too, treacly and oily, and it just hangs on your taste-buds for quite some time while you dream of a warm fire and distant, rolling landscapes. At first glance, it's delicious. The Glenfarclas distillery has been a more or less ‘family-owned’ enterprise for well over a century. The distillery is well recognized for a broad and approachable range of malt whiskies, including the cask-strength ‘105’ and an awfully well-priced 40 year-old expression. The Glenfarclas 15, in particular, is something of a storied dram amongst the membership of the Connosr community. To many, it seems especially reminiscent of Christmas cakes and puddings but—being of Jewish ancestry and having had no Christmas tradition permeate my atheist-buttressed childhood—I know little of such treats. Thus, I provide a more ‘secular’ review of this whisky. The nose is predominantly malt, burnt salt caramels, and fiery red pepper jelly. There are hints of coffee, chocolate, and tobacco smoke. Though rich and heady, there is an herbal, almost eucalyptus, undercurrent to it. The palate is rich, malty, and sweet, with slightly over-cooked caramel, spicy chillies, and cherry licorice. There are notes of coffee, ginger, and crème brulée, and a decadently bitter finish of chocolate orange. Initially, I found the Glenfarclas 15 overly ‘hot’ on the nose and bracing on the palate. A switch of glassware to a sherry copita, however, seems to have tamed this whisky somewhat, and it has since grown on me. For those in search of a dessert malt. Thanks for the kind words, folks. @LeFrog, the heat was really not something I had expected. I poured it at a friend's house initially, where we had it in wine glasses as there were no Glencairns about, and everybody steered clear of the mouth of the glass, other than to drink. I agree about the 'heat' on the nose and mouth feel. I find that this is a whisky you really need to warm in the hand, allowing it a bit of time to open up and react with the air softens it beautifully. I have high hopes for this whisky. Everything I have heard about it is that it is a sherry bomb of a dram, and probably the best tasting of the Glenfarclas line. However, it is my understanding that the 15yr is not available in the United States, as the inventory is not able to support the US market. So, it is a real treat for me to even be able to taste this expression from Glenfarclas. So let us get on with the tasting! This sample comes from a 46% ABV bottling. Nose: Sherry up front! This is starting off right. Walnuts and currants! Ooh! Magnificent nose on this one! Getting some nose tingle. Honey, vanilla, brown sugar! Getting some dried fruits and could that be just a whiff of smoke? Spice. Body: Creamy! GREAT mouth feel! Finish: The finish is a bit short, but the fact I held this whisky in my mouth for quite a while is probably a factor there! Otherwise, this has an incredibly wonderful finish, releasing sweet dates, almonds, and some pepper. Nice review jwise. I have been working on a bottle of Glenfarclas 17 for a while and decided it was time to try the 15. A much more complex dram than the 17. The higher ABV helps and it just generally has much more character than the 17 which is a bit standard issue. Nice but unexciting. I just received two bottles of Glenfarclas 15yr from the UK! I cracked open one of them, and just served myself a healthy pour! Mmmmmmmm!! This is GOOD! While I felt the 10 Year Old is a flawless (and rather nicely priced) Speysider, I feel the 15 Year Old has quite a bit more to offer. The nose offers sherry (dark fruit), but also some young apples, very fresh and lively. Some nuts and something that reminds me of rum. Toffee and raisins. White coffee. A touch waxy. I can spend 30 minutes just smelling this dram before sipping. Salivating! The attack is quite powerful (this has an ABV of 46%), with again very sweet notes that remind me of rum and apricote marmalade. Cinnamon and white pepper. Figs, sultanas, red apples and a hint of honey. I like it! The finish is warm and long, but a tad bitter. While this is not an axiom (because age doesn't necessarily mean quality! ), I gladly apply this 'mathematical formula' to this one: A+50% = T+50%, with the A for Age and T for Taste. In short, half older and half better. Math was never my strong suit. 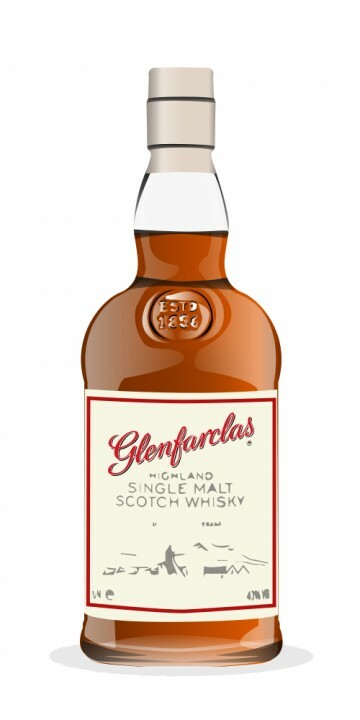 @markjedi1, I'm glad that you reviewed these Glenfarclases. The one I have is the 12-year, which I felt might be the closest to the much lauded 15-year, that i could find in the States. Have you tried the 12 ? @AboutChoice I have not tried the 12 yet, sorry. Tonight I'll try the '105' cask strength, but also the 1994 signel cask. Nose : Sherry notes, earthy peat and some wet earthy sand, dry fruits and leather . rather complex concoction. Butterscotch. Finish: Dark chocolate, sherried fruit and some metal notes and wee smoky trail. I agree with the reviews, this really delivers everything you could want from a luxurious, rich, sherried whisky. It is the epitome of that style of malt but also has smoke and peat, and wood all in a harmonious symphony with the christmas pud. Long finish, this whisky has soul and it is as close to perfection any whisky could be. Really, a stone cold classic! I would give it 10 stars but I am saving that spot for the tears of angels when I die and go to Heaven. Hmmm... I keep passing over GlenFarclas when I see it in the liquor store... I'm not sure why. But I think I might just pick it one up soon if it's that good. With 15 year old sherry cask whiskies it's all about the sherry and power. On the nose it's sherry with a hint of wet wood and perhaps a bit of varnish. On its own you have more wood, sherry of course, I've been told that Turkish Delight is there but although I can sense sweetness this eludes me. Sweet and hot nuts like you get in pubs (or used too) is the finishing taste, with a lot of the flavours seem to dilute rather than being enhanced so try this more without adding water. The finish is rich, sweet and creamy, lots of power and not one for the novice but well worth the 40 quid should you want something a bit different. Nice review. What's the colour on this John? Medium bodied but it is a blast at that. This 15yo is one of my favourites at the moment. Its one of those that open up memories of good times (with whisky and without). Memories of Happy days of snowy dark, and cold winters mornings. It brings lot of good emotions to surface that have been hidden inside for generations. Best enjoyed alone with good music and private memories. If you offer drum to someone make sure it is good friend of your with lot of memories to share and dip in. I like the sound of that. Nicely put. Outstanding. This is a sweet, beautifully balanced, festive, after dinner delight. Nose: oranges, sherry, nutty malt, a hint of tar, candied fruit. Palate: less honeyed than I expected, rich texture, spiced fruit, sherry, oranges, those hazelnut notes. Even neat you can hold this in the mouth for a good long while, a little burn but it warms you through. Stands up to a drop of water but I prefer it straight up and on the warm side of room temperature. This is a whisky you can sit and savour and be overpowered by. No need to think, just feel what's going on in your mouth. It is the fruits of the sherry. The winey sherry bombs are the Aberlour 15yr Sherry Wood Finish and the Arran Sherry Single Cask. I still like those, but I could understand why others don't. "This is a whisky you can sit and savour and be overpowered by. No need to think, just feel what's going on in your mouth." I've been eyeing this for some time. I know it's a big sherry bomb but is it obvious sherry (real winey) or more the fruits of the sherry? My lovely wife purchased me 4 separate malts for Christmas, and finally relented allowing me to access them as of today (Christmas Eve). This is the first, it came in an impressive open faced box with small taster bottles of the Glenfarclas 21 and 25 year old (so reviews of them to follow, along with the other three drams, over the coming days). The nose is warm, with pine nuts, glace cherries, heather, just a hint of smoke, and heavy vanilla fruitiness. There is more than a hint of Christmas Cake about this one. With a few drops, the heather strengthens, and a honey, nutty note comes through to complement the rich fruit cake smell. The taste is warm and rich, full of cherries, raisins, a hint of chocolate. Further sips reveal a hint of grains and a touch of spice. There is a lot going on here, and every sip emphasises something different. Very engaging. The finish is warm, sweet, still full of dried fruit gently balanced by a mild spiciness, and so thick it is almost buttery or creamy. It's strong and embracing. This is a genuinely warm sweet after-dessert whisky. On a cold night after warm pudding, it would be divine. Even in the Aussie summer, this dram hits the nail square on the head. @galg - It's not just the fact that she bought me some fine whiskies - it's the amount of time and effort she put into which whiskies to buy. She wrote down and sorted my wish-list, read all my reviews, looked at comments I've made in various discussions, watched what kind of whiskies I was drinking, and then agonised for a number of days over which drams to buy. Frankly, the thought and effort she put in takes these drams from being a damn fine present to being one of the best Christmas presents ever. I'm chuffed to bits. And I get to enjoy excellent drams like this one! My dad bought me a bottle of this as part of my 50th Birthday present 3 years ago. It was great. I also found that it benefited from adding a drop of water, which i normally never do, but as its 46% it can withstand a slight dilution and definielty seemed to open up the flavour even more. Honey, toffee, nectar! Palate: sherry, malt, honey, nutty, peaty, long-lasting finale. Every single malt kind of taste different and this one is no exception. The new release from Glenfarclas of their 15 yo is absolutely superb - fabulous combination of malt nuttiness, sherry, peat and a lingering woody final. No joke this is one of the best 15yo out there and probably one of the best in the Glenfarclas range (except the 21 and 25 yo which are both outstanding). Finally, this single malt is Christmas cake big time and one of my preferred whisky of the Holidays. This is one of the bottles my wife has bought for my xmas pressie. I am very much looking forward to it! The best comparison for GF15 is probably not to a whisky, but to another 15 year old - El Dorado 15 Year Old Rum (distilled in Guyana in Wooden [yes, wooden!] pot-stills). The depth of complexity in this rum is simply mind-boggling, and it's really quite a challenge to simply understand what's going on in the glass. It's much the same deal with GF15 - it's so full-flavoured and complex, that the best way to pull the flavour profile apart is to make reference to something else (christmas cake) that's so incredibly packed full of condensed and concentrated dried-fruit flavour that you almost accept the overwhelmingness of it as a given. Now, if you take into account the fact that rum matures roughly 3 times faster in the tropics than whisky does in Scotland, and you begin to comprehend the level of sophistication and complexity that you're geting for less than £40. This would, without a shadow of a doubt be in my top ten desert island whiskies, and I heartily, heartily recommend that you all try it just as soon as you can. Benellefsen, keep writing reviews like these and my X-mas list will keep my whole family occupied for the next decade. Seriously, when I read this, I just have to go out and get it. Damn, this hobby is becoming expensive very rapidly!